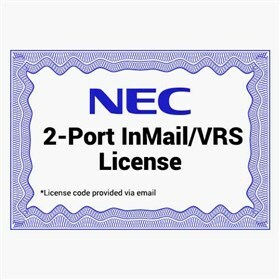 The NEC 1100083 is a 2-Port InMail/VRS License, which can be used to expand your InMail voicemail by two extra ports. Maximum 16 ports are allowed per system. It requires system equipped with an InMail compact flash. The NEC 1100083 has many exciting features for users of all types. The NEC 1100083 is sold as a Brand New Unopened Item.